Holland America offers their seven day Canada & New England Discovery Cruise from either Boston to Montreal or Montreal to Boston. We chose the Boston to Montreal cruise and added two additional nights to explore Montreal at the end of the cruise. These ports along the northern Atlantic coast offer both incredible history and breathtaking scenery. Our flight arrived at Boston Logan airport at 12:20 p.m. We called for an Uber and after the first driver dropped us off in the wrong location (Chinatown), a second driver delivered us to the port by 1:30 p.m. Check-in was speedy and efficient. We were on the ship and in our cabin within just a few minutes of arrival. 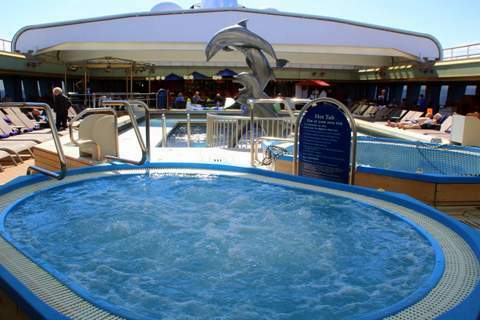 We put our backpacks in our cabin and our valuables in our safe then headed up to the Lido deck for a buffet lunch. Before sailaway, all passengers were required to participate in the mandatory safety drill. 1300 passengers gathered in organized groups on the promenade deck while learning how to survive an emergency evacuation. As usual, experienced passengers made the best of the situation with a cheerful attitude while making new friends with those nearby. The Veendam cruised out of Boston Harbor at 4:00 p.m. Settled in 1763, Bar Harbor has a rich history as a fishing village, an artists' retreat and a vacation destination. As we arrived by ship, the view was spectacular with rolling waves crashing onto the rocky shoreline, green trees surrounding beautiful homes, a quaint downtown and majestic mountains in the background. The Veendam anchored in the harbor and we used tenders to get to shore. While many of our fellow travelers took scenic tours to the 49,000 acre Acadia National Park, we chose to stroll the streets and waterfront of Bar Harbor. If you like Mom and Pop stores and galleries, Bar Harbor's downtown will be a delight. Whether you're looking for souvenirs, clothes, art or a meal, you'll find a number of options. Don't miss the Christmas themed store with handmade gifts or the Village Green which offers beautiful views of the harbor. 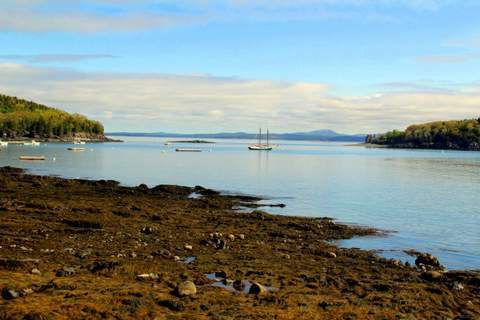 Our favorite Bar Harbor asset is the Shore Path along the shore of Frenchmen's Bay. About one mile long, the path winds along the seawall. The views are a photographer's dream come true. One one side of the path we photographed the harbor, Atlantic Ocean, rock formations and the Porcupine Islands. On the other side of the path are historic homes and beautiful inns. Both sides offer gorgeous views. If you're fortunate to visit just before high tide, you'll have a chance to see Thunder Hole where the surf rolls into a natural cavern and creates water sprays forty feet high. Located on the eastern coast of Canada, Halifax, Nova Scotia is home to over 400,000 people. A starting point for hundreds of thousands of immigrants, Halifax is to Canada what Ellis Island is to the USA. The Canada Immigration Museum is right at the pier. Halifax is also well known for its maritime history. It is home to a naval base and the Maritime Museum of the Atlantic. Halifax became the site of the largest man-made explosion (until Hiroshima) when a French ammunition ship collided with a Belgian ship during WWI. The blast levelled two miles of structures, killed 2000 people and injured 9000. Halifax is also the burial place for many victims of the Titanic disaster. The Fairview Lawn Cemetery is the final resting place for 121 Titanic passengers and the Maritime Museum of the Atlantic exhibits Titanic artifacts. 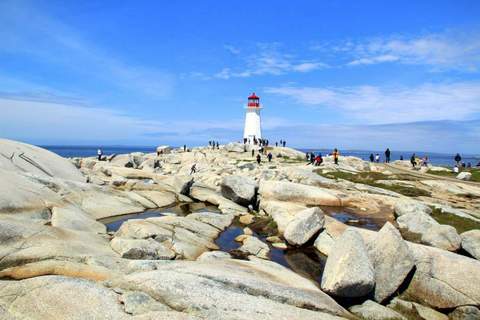 We chose to make the one-hour journey to the picturesque Peggy’s Cove which is home to the most photographed lighthouse in Canada. It is well worth the drive. Photographers love the iconic lighthouse, the rugged coastline, the house-size boulders, the fishing boats with lobster traps, and the beautiful sculptures. Sydney is located on the eastern tip of Cape Breton Island. It is the largest “urban hub” of the island. Its early growth was due to its steel industry but it is best known now as a tourist destination. 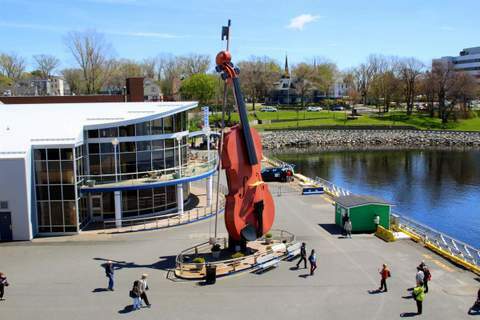 It is home to the world’s largest fiddle which you’ll see as you exit the ship. Sightseeing highlights include Fortress Louisburg, the 180 mile Cabot Trail, Bras d’Or Lakes, and the Nova Scotia Highlands Village – a living history museum that celebrates the Gaelic way of life. There are also two nearby beaches. We chose to enjoy a scenic stroll along the waterfront boardwalk where we photographed a beautiful and touching monument to men who risked their lives sailing from Sydney to provide important supplies during WW2 and whose merchant ships were stalked by Nazi submarines. Another monument titled “A Land of Our Own” stands in memory of immigrants to Cape Breton. We also walked the path around beautiful Wentworth Park where we enjoyed the lake, lake fountains, tulips and ducks. Charlottetown is known as the birthplace of Canada. 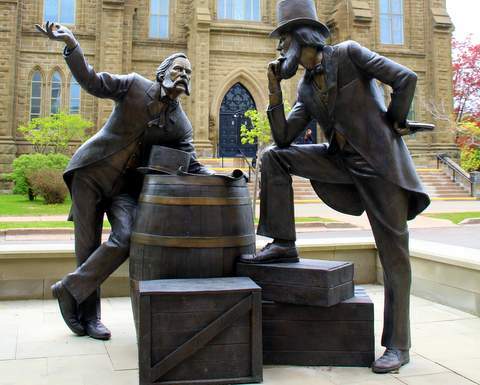 Delegates arrived here in 1867 to decide whether Canada should seek its own path. Even though the town has less than 40,000 residents, more than one million tourists visit each year. Tourism has taken the place of shipbuilding as the main revenue source. Photographers will want to be on deck as the ship nears Charlottetown to photograph two lighthouses. The Veendam docked at a pier right in the heart of town. The port building offers souvenirs, snacks, tour tickets, restrooms and free wifi access. Charlottetown is the home of the classic "Anne of Green Gables." There is an official Anne of Green Gables store, an Anne of Green Gables chocolate shop and more. Theater lovers can enjoy Canada's longest running musical: Anne of Green Gables. We chose to book a tour online with Rusty Rover Tours. Our tour guide Alan Buchanan is the retired Attorney General who is now an actor and professional storyteller. He gave us an excellent, laugh-filled tour of Charlottetown. Everyone in town seemed to know Alan and stopped to greet him. At one point, Alan had us laughing out loud as he took us into a posh hotel where Elton John, Rod Stewart, Reba McEntire and other stars had lodged. Alan went up to the front desk and asked for a room big enough to hold 24! The hotel staff played along and soon we were all laughing together. We arrived in Quebec at 7:00 a.m. The ship docked at the bottom of the old Quebec historic district with a beautiful view of Chateau Frontenac. We walked Rue St. Louis and Dufferin Terrace - the promenade and boardwalk. We visited Chateau Frontenac, Place Royale, The Quebec Citadel fortress, Notre Dame de Quebec, the Parliament and more. Owner Samuel Dubois is a certified tour guide. At the end of the tour, you pay Samuel whatever you can afford. On our tour, we were an eclectic group from USA, Germany, Brazil, Japan and Canada. After our tour, we agreed that Samuel's "Free Tour Of Old Quebec" was one of the best tours we have experienced anywhere. Samuel walked us through the Old Quebec historic district while giving us insight into the history and politics of Quebec, the traditions of the people, the best dining, the best views, locations of Alfred Hitchcock, Tom Hanks and Leonardo Dicaprio movies, and a full two hours of laughs. We cannot recommend Samuel Dubois highly enough! Our Holland America Canada & New England Discovery Cruise ended in Montreal. Montreal is the second largest city in Canada and is located on the Saint Lawrence River. Native American relics have been discovered dating back 2000 years before Europeans arrived in 1611. We booked a room in the Marriott Residence Inn Montreal Downtown. Our twelfth floor room overlooked the busy downtown but was amazingly quiet. Our room had two beds, a stove, refrigerator, microwave, dishwasher, sink, large screen TV, private bath, free wifi and complimentary breakfast! 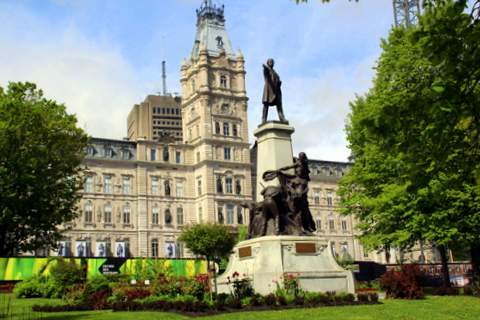 We were just a short stroll from nightlife, restaurants, the Old Montreal historic district and the Metro. We purchased a $10 Metro pass which gave us unlimited rides for 24 hours. We used the Metro to visit the Olympic Stadium, Montreal Botanical Garden and the Biosphere. A friend who lives in Montreal took us to the top of Mont Royal for fantastic panoramic views of the city. 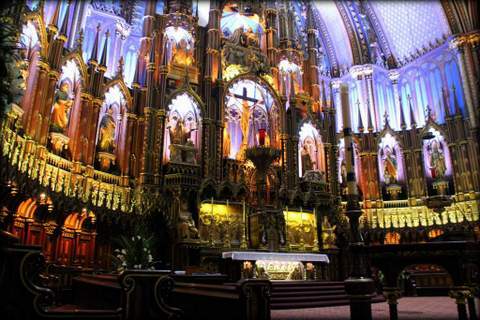 He also showed us the Notre Dame Basilica where Celine Dion was married and the thriving waterfront entertainment district along the Saint Lawrence River. Finding a restaurant in Montreal is easy - stroll along just about any street downtown and there is bound to be a restaurant or two or three around the corner. One of our Montreal favorites is Reuben's Deli & Steakhouse on St. Catherine Street. Whether you are hungry for a burger, steak, salad or pasta, Reuben's has it and their service is excellent. The Holland America Veendam carries 1352 guests and 590 crew members. She is 719 feet long. Our Holland America Canada & New England Discovery Cruise traveled 1557 miles over seven days. The Veendam offers a casino, evening entertainment in the Showroom At Sea, several cocktail lounges, a swimming pool, hot tubs, a spa, a buffet and a more formal dining option. Our Holland America Canada & New England Discovery Cruise from Boston, Massachusetts, USA to Montreal, Canada on the Veendam gave us seven days of both incredible history and breathtaking scenery. the best travel news, tips & reviews for traveling families everywhere!